Boxelder bugs are generally black and red and have been identified in most states of the Union. Although other insects closely related to Boxelders look similar including the milkweed bug, none are likely to congregate in huge numbers like boxelder bugs. Members of this insect family feed on woody plants and herbs. The boxelder bug got it’s name because it was found to infest boxelder trees. These trees were planted in the west as settlers wanted quick growing shade trees. The availability of the vast numbers of boxelder trees allowed the boxelder bug to flourish. It now infests many other species of trees including maples, apple and almond. It seems to target a wide range of dead insects for food but will feed up on plants, vegetables and fruit when available. Boxelder bugs become a problem when they move into your yard or home. Once they infest a tree, their population will grow from year to year. You’ll notice them congregating in massive numbers on the tree bark, limbs and the immediate ground surrounding the tree. This congregation will occur in the spring and then again in the fall. In the spring, the boxelder emerges from its winter hibernation looking for a tree or plant that will supply food for the season; in the fall it will migrate to “scented” locations on which to hibernate during the colder months of the year. Boxelder bug young hatch in early summer and grow like roaches; they develop by instars. This means they go through several stages which resemble adults but will be smaller in size. As they molt (shed their exoskeleton) and begin a new instar, they’ll become more and more like their reproducing parents. In the fall, they will seek the south or warm side of the tree or plant they’ve been feeding on throughout the summer. As it cools even more, boxelder bugs will take up residence in nearby homes and structures naturally drawn to the radiating warmth. Since they over- winter and do not die from year to year, a population can reach huge numbers. This “colony” will readily infest the same area from year to year once a successful winter shelter has been found. Some will migrate onto your home, up under the siding and roofing and ultimately, inside. Besides the damage to leaves, fruit and trees around the home, if allowed to infest your house they will end up invading living spaces when its too cold for them to be outside. Expect to have them climbing walls, clinging to curtains and buzzing around lights and ceilings throughout the winter. Since most homes are heated, boxelders don’t need to “sleep” through the cold. Instead, they will forage causing discomfort and being a nuisance until the spring. Here is a short video of one inside a home. This boxelder was filmed in the middle of winter but because it’s warm inside, they’ll stay active. This video shows many phases of Boxelder Bugs so you can see adults compared to nymphs. All sizes will be common when you have an active infestation. One might think that you can keep them out of the house by properly sealing up all entry points. But we have found this is usually an effort in futility. Basically most any home has so many routes of entry, its not possible to get them all. But it can help and should be done. If not to keep out bugs to keep the warm air inside. So if you attempt to seal them out, be sure to use quality products. No doubt homes which get invaded have lots and lots of small cracks, crevices and gaps through which boxelders enter. These entry points should be reduced and/or eliminated and a good product to start with is what professionals use known as PUR FOAM SEALENT. These cans are self charged and good for small jobs. They can put down a 3/8th” bead of sealant over 1000 feet long. If you expect to need 2 or more cans, get the larger 25 oz of PUR FOAM SEALANT. It can lay over 1600 feet of sealant per can and will be more cost effective. You will need a FOAM GUN when using the larger cans but they’re well worth the investment. Basically they’ll make the task a lot easier allowing for a nice, precise bead of foam to be distributed without waste. You’ll also need some FOAM GUN CLEANER to keep the guns clean and ready to go to work when next needed. No doubt boxelder bugs will make a mess. Their droppings will accumulate everywhere and their eggs will appear as a series of small sacks laid 6-12 in a row. Since warm homes interfere with their natural cycles and biology, you may find them reproducing and egg laying throughout the winter. To stop them from being a pest all winter, you need to treat outside in the fall. So to start, you need to keep them off the home. This sounds easy but it can be tricky. Most infestations start slowly and therefore can be hard to notice. But if you’ve seen them congregating on a nearby tree or active on the side of your house, you need to spray immediately. 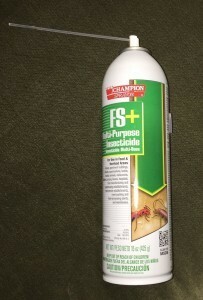 Use CYPERMETHRIN and SPREADER STICKER for a quick kill and long lasting residual. Cypermethrin is fast acting and the Spreader Sticker will enable it to “spread” over the bugs better which enhances the overall result. Be sure to spray high up your home, preferably to the roof line, and then around windows, doors, shutters, etc. Boxelder bugs love light fixtures and will find any crack or crevice so be sure to get them all. Next, any tree, plant or inanimate object you see them accumulating on should be sprayed too. 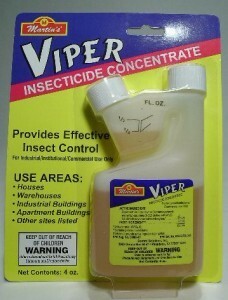 This will reduce the active bugs in the yard wanting to nest in and around your home. By reducing these numbers you are reducing the amount that could find their way inside. The Cypermethrin should be mixed at the rate of 1 oz per gallon of water and a mixed gallon can cover up to 500 sq/ft. 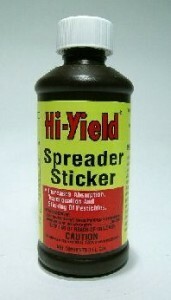 Add 1 oz of Spreader Sticker to the tank mix with the 1 oz of Cypermethrin. And be sure to use a good PUMP SPRAYER for the treatment. 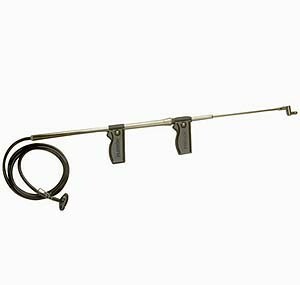 If you have to reach up over 15 feet, consider our TROMBONE SPRAYER. It can reach up to 30 feet and will save time and effort for hard to reach tree tops or structures. Boxelder bugs will thrive in pine straw and even in the ground. They will nest just under the top layer of soil feeding on roots, sap and leaf litter. That means if you’re seeing activity on a tree, you need to treat the ground around the tree. For this treatment, the use of DELTAGARD GRANULES are well suited. Use 2 lbs for every 1,000 sq/ft. Our 20 lb bag will cover up to 1/4 acre and should be applied once a month for active problems; once a quarter for preventive treatments. 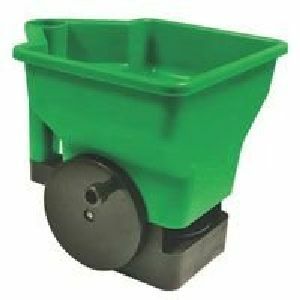 Use a traditional “push” type fertilizer spreader to apply Delta Gard. A HAND HELD SPREADER can be used too. In most cases, killing the active boxelder bugs will allow infested trees or shrubs to survive. Too many times an infested tree is taken down because the homeowner suspected it would die. But just because you see a lot of bugs does not mean your tree will automatically die. In general, trees and shrubs are quite resilient. And if you give them 6-12 months following the control of the problem, you will be able to tell if they’re coming back or gone for good. To help identify just how unhealthy they might be, a pair of STRESS GLASSES can help. 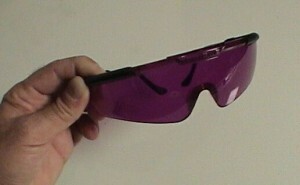 These unique filtering glasses will reveal just which shrubs and trees are under duress and need attention. Be sure to treat around them with the Granules and liquid Cypermethrin to insure you get any insect that might be causing your trees a problem. Now if you discover the activity is distributed over a large area, like 5,000 sq/ft or more, go with CYONARA RTS instead of Cypermethrin. Cyonara is closely related to Cypermethrin but it’s designed for covering large areas more effectively. 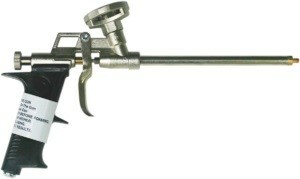 And since it comes with it’s own hose end sprayer, it’s easier to apply by using the garden hose to do the spraying. Each jug is 32 oz and can cover up to 1/2 acre. And it works on a wide range of pest too, not just boxelder bugs. If the boxelder bugs have already moved inside and have started to be annoying in the home, you’ll need to get them where they’re nesting. This will usually be in the wall under an electric outlet cover or around a window frame. It could also be in a chimney or light fixture. For rooms where you’re unsure of where they’re nesting, PT-PHANTOM AEROSOL is a good option. It uses an active which insects will not detect and will readily walk over. The active doesn’t act quickly but instead will take 3-4 days to kill. But when one bug picks up some active it will in turn “transfer” the chemical to other bugs. This is very helpful because when it does kick in and start to work, it will many times kill many bugs even if just 1-2 walked over the treated area. Phantom has virtually no odor and goes on relatively dry when used properly. Use it on window sills, door frames and basically spot treat anywhere you see them active. Retreat every 2 weeks until the problem is gone. It will usually take 4-6 weeks for all nests to die off. Now if you know exactly where the boxelder bugs are hiding and have found them using the same areas over and over again, the FS MP AEROSOL might be the better treatment to use. Its fast acting and will kill in seconds. Since boxelder bugs can congregate in big numbers, having a fast acting killing agent is sometimes handy and FS MP is made for this need. It comes with a crack and crevice straw for hard to treat voids and will both flush and kill immediately. Use it every 2 weeks to make sure the treatment is fresh – especially for outside areas which are subject to the weather. Once you treat, only time will enable the application to kill off the problem. If you got them before winter, there is a good chance you won’t have them all winter long. But if they’re already inside living rooms, keep a vacuum handy. Alternatively, we have a couple of devices that are both handy and effective at removing single boxelder bugs one at at time. First, the HAND HELD ZAPPER c is a powerful tennis racquet looking device that will kill any bug in seconds. Its handy because it works within a few seconds and can be kept discreetly out of sight. But when needed, its ready to go with a push of a button. The second option is the BUG VACUUM ZAPPER. This device is the “humane” option. It features a long extension tube so you can vacuum up the boxelder bug and once captured, decide its fate. You can “fry it” by using the built in zapper or take it outside and let it go to live another day. You control its destiny. Treating for boxelder bugs before they move into the wall voids of your home is the best way to stop invading populations. Expect to see them grouping in the fall as they prepare for their winter hibernation. Treat these congregations with Cypermethrin for quick control. If they have already established themselves inside, you will need to treat outside populations with cypermethrin, exterior wall cracks with Drione Dust and interior entrance cracks with PT Phantom. This practical approach will stop new infestations, force them away from your beneficial trees and shrubs in your yard and keep your home from becoming their winter play ground. Thanks for your help. The pictures were the best way to identify the bug. Can’t you just cut the trees down and eliminate the bugs all together. Just bought a home, has 2 trees in back and the bugs are swarming all over the gazebo and house. I can’t see where there are any leaves on these trees. Of course you can remove the trees but why? If you want to remove these trees thinking it will get rid of the boxelder bugs, you’re mistaken. Here’s why. Boxelders will come to certain trees to feed. They’ll do this in the spring, summer and fall. During the winter, they tend to amass and hibernate on these very same trees. But they also use homes as a place to hibernate because it’s nice and warm, has lots of cracks and crevices in which to hide and many times will provide much more protection from the harshness of winter. And if you have boxelder bugs on your home now, they’re using it to hibernate whether they visit the trees in your yard or not. So yes, you can remove the trees in your yard but it’s not likely this will have any impact on the boxelders that are using your home. More importantly, once boxelderbugs start hibernating on a house, they’ll leave their scent all over it which in turn will attract more boxelders the following year. So ultimately if you don’t treat, the problem will get increasingly worse. And if that’s not bad enough, it gets worse. Boxelders love the southern and western facing sides of any home. Ironically trees will many times shade a home which boxelders don’t like. During the winter, they love homes with no trees around them because these homes get the most direct sun. So in fact removing your trees could actually make the home more attractive to boxelder bugs! Now if you see lots of boxelder bugs on your trees and don’t want them there, you can spray the bark of the tree and that will take care of them. But boxelder bugs rarely feed enough on any one tree to damage it so in most cases, spraying any tree when they are living or hibernating on it is not needed. Lastly, boxelder bugs can easily travel several miles to find food. So even without nearby trees, the ones living on your house will merely fly off to get dinner elsewhere and come back to your house to live no matter how many of your own trees you cut down. In the end, removing trees won’t help the problem. But a simple fall and spring treatment with some Cypermethrin will keep them off your house and out of your living spaces for good. We have found random Box Elders in our home for over a year. We are looking to treat the exterior of our house this spring but believe we have colonies inside. How do you find indoor colonies that may be living in walls? And what is the best method to eliminate (in addition to exterior treatment)? As explained above in our article, you should dust wall voids to kill existing nests that may have moved into these voids. Listed above is Drione which works great but the less costly Deltamethrin Dust can do the job too. Apply these using a Hand Duster. In most cases, there will be 1-2 sides of the home the boxelder bugs are using but you should be able to figure it out based largely on where you’re seeing them. As for the outside; treating in the spring is important and that could very well be now. Well, maybe not just yet depending on whether you’re seeing them or not on the outside of the home. But here in GA, they’ve been active the past few weeks which means it’s definitely time to spray. Exterior treatments should be done in the spring and then again in the fall. And sometime during the summer it would be wise to seal all the entrance ways you can see around windows, door frames, soffits, rain gutters, etc. This can really help. 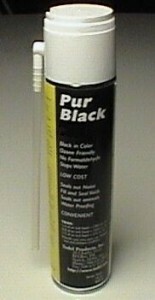 The Pur Foam we have listed above is by far the best way to seal them out. And don’t forget to dust the cracks before you seal them. We had a rough time with them in the summer but I thought they die when it’s this cold. Now there are a few in the house and I’m just wondering why? Is there a nest like you spoke about somewhere? We live by the river. Does that contribute to the problem? If you read our article above, you’ll learn that if you let boxelder bugs live on or around your home, they’ll end up inside once it gets cold. This is because they don’t die from year to year but instead hibernate. Boxelder bugs love to hibernate on manmade structures and once they’re hibernating on a home, they’ll readily move inside because the inside of most any home is usually warmer than the outside air during the winter months. So to answer your questions; they’re coming inside your home because there must have been some nesting on the exterior of your home this past fall. And living by a river would no doubt “help” because it usually means there will be moisture and good ground cover which they need for nesting. But even with a river close by there is no need to have a boxelder problem if you take a proactive stance and treat as explained above. Now since they’re probably not active outside if it’s winter by you now, I would focus my attention on the inside of the home for now. And that means a lot of crack and crevice treating with some Phantom aerosol. Phantom is an odorless material that will last a month or so when applied to cracks and crevices around the baseboard, window frames, door frames, outside light fixtures, etc. where boxelder bugs nest. And once you kill them in these nest sights, you should see a reduction in how many are active in the home for now. Come spring, you should do some treating outside to insure they’re not nesting in the mulch, under pine straw or on your homes siding. These treatments will involve the Deltagard Granules applied to the ground and the Cypermethrin sprayed on the homes exterior. Doing these treatments every 1-2 months will both kill off any populations living on the home and help to prevent any more from coming back to hibernate next fall. In the end, these applications will insure you don’t get any inside come next winter. I have the Box Elders you show outside my house and some get inside but my real problem inside and out is a smaller version that is tan/gray in color and when you catch one they leave a sage type scent on you that’s hard to get rid of. Someone told me they were box elders but they look different and hang around box elders. My home is infested and nothing seems to kill them. What I want to know is will your pesticides kill them? And what exactly are they? I can send you some in an envelope for identification. Any way, help me pleaaasseee… Dave. 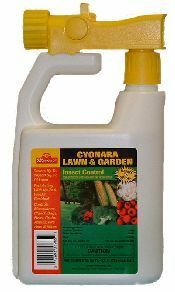 In fact we generally recommend the Cypermethrin and Spreader Sticker for any type of invasive pest like Boxelders, Asian Ladybugs, Kudzu Beetles, Stink Bugs, Ants and Wood Roaches. So whatever this beetle turns out to be, I’m sure the Cypermethrin can handle spray it so start with this applied to the outside of the home. Inside, go with either the Dforce (strongest with a slight smell) or Phantom (odorless but takes 2-3 days to start killing). Now if I was to guess what this bug might be without seeing a sample, I’d have to go with either Stinkbugs or Kudzu Bugs. Stinkbugs are about as large as Boxelders but the Kudzu Beetle is much smaller. Hi. I have the boxelder poop on the house and had it professionally cleaned and it didn’t come off. Do you know of anything that will take it off? Thank you. We have had similar reports over the years that the feces from boxelder bugs can stain with the only remedy to be painting over the stains. Be sure to add some NBS Paint Additive to the paint too. This way you’ll have in place a long lasting repellent to keep new boxelder bugs from coming around as well as many other pests that can stain your house. Alternatively you can spray the Cypermethrin to repel them because even if you paint, once your home is marked by this pest it will constantly be attracting them unless you spray. Thank you for all the info on boxelder bugs. My first battleground with these bugs was on my porch with a flyswatter (killing about 50 a day). However that form of assault doesn’t seem to reduce the number. My next form of defense will be this cypermethrin you mentioned. Thanx again. Bill. No doubt the Cypermethrin will help. But remember to treat the surrounding area just off the porch. My guess is there must a nest close by, maybe in some mulch, which is breeding all the numbers you’re finding. Get those areas sprayed too and you’ll see even better results. The remedies you site with the spray and granules, are they safe for dogs or other pets? I have an infestation of boxelder insects in the back corner of my lot. I had it treated by a professional pest company on the split rail fence, post and tree. However, I need something for my tomatoes, peppers etc. I found two red tomatoes ‘covered’ with them yesterday. What can I use on them? Thanks. No doubt boxelder bugs will target vegetable gardens from time to time. And since the products listed above aren’t to be used on vegetables, I’d recommend our organic MultiPurpose Insect Killer. It’s approved for use in organic gardens, works great on a wide range of pests and even though it doesn’t say Boxelder Bugs on it’s label, it will definitely kill them. It can be used daily if needed since it has a “one day to harvest” label. But we’ve found that after people treat and knock out the initial infestations, they can usually go several days and even weeks between treatments after just 1-2 applications. Hello my previous apartment became slowly filled with box elder bugs. At first we noticed big ones then noticed them mating and then started finding eggs and babies and since our landlord did nothing we finally were able to move out. I tried to clean everything and search through everything the best I could before the move but I’m nervous the babies will follow us and we will have a never ending problem. We have been moved in for about a week and I have seen only one baby. There are no trees or really any grass around us..any suggestions or thoughts? Thanks! Boxelders are easy to transfer from one location to another once they infest the living area of any home and the residents then up and move. To make sure they’re aren’t more where you now live, I suggest you do a thorough treatment of the living areas with an aerosol. Phantom would be a good choice for this task since it’s highly effective on Boxelders. 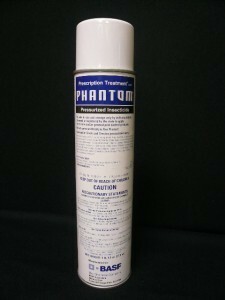 Phantom is odorless, goes on dry and lasts a long time. Treat all the moldings, around windows and any place you know they like to live based on where you saw them at your last residence. This will insure any you brought with you won’t have a chance to start a new population where you live. I have a mandevilla tropical plant that boxelders are all over. I need to bring it in for the winter months but don’t want to bring it in until the bugs are gone. Anything safe for tropical plants? Any suggestions will be very much appreciated. The word “tropical” when applied to plants means the plant is native to a tropical climate. And though these plants may be sensitive to cold temperatures, they are no more likely to be sensitive to any of the treatments we can use to control parasitic pests like boxelder bugs. That being said, since I don’t how large your plant is, the general health of it nor how it might react to the more common materials I’d normally recommend, the use of something approved for organic gardening would be a fine work around that should take care of the problem yet keep your plant safe. Fortunately we have two organic gardening approved products that will be gentle yet strong enough to handle boxelder bugs. The first one is an aerosol. Known as House Plant Insect Killer, this spray is easy to apply and will provide immediate relief. Boxelders don’t like it and will stay off treated plants for a day or two. They will also die if sprayed directly. Now if your plant is small, one can would be enough to handle the problem. Simply spray it down, let it sit for half a day and then once the bugs are all dead or gone, bring the plant inside. But if you have a lot of plants to treat, the organic Multi Purpose Insect Killer would be the more efficient option. It’s a liquid you’ll mix with water and spray with a standard Pump Sprayer. Multi Purpose Insect Killer is highly effective on a wide range of pests including Boxelders. Just had box elder trees cut by city that were along ally boarding our property line that were interfering with power lines. They were outside our property line. Now we are greatly infested with the bugs in all sizes as they were in the trees reproducing. They are up and down tree limbs, all over almost anything including the grass, millions of them, the house is stucco and white. We have sprayed with some spray also laundry detergent mixture. Do we now try to use granules on grass and stronger spray on house and trees?? Please help we are quite worried how many are getting into walls. Thank you. No doubt the random take down of any tree can dislodge and relocate animals and insects alike. And when it comes to insects like boxelder bugs, the numbers can be astounding! I suggest you get the Deltagard Granules applied immediately followed up by the Cypermethrin. The Cypermethrin should be applied to any tree and ground area where you see activity. Next, spray the exterior of the home to prevent nesting. Now if you jump on this quick, you’ll be able to knock out any trying to relocate to your home. With fall fast approaching, they’re no doubt looking for a place to overwinter and rest assured, you don’t want your home to be their prime location of choice! We have a tree that is covered from top to bottom, inside and out (it appears) with boxelder bugs. Before I saw this site, I sprayed the bugs on the trunk with sevin, some fell off, but they’re still milling around. Oh, they’re in the grass and beginning up another trunk, too. I’ll try the products you recommend, but what about the thousands that are up covering the branches on the treetop (say 40 feet)? Thanks for any help. Before you do any spraying, be sure to get the Deltagard applied to as much of your turf as you can. This is important because when you spray, many will flush off the tree and migrate to other parts of your property. Now if you don’t have the granules in place prior to spraying, boxelders can elude the treatment and that means they’ll continue to thrive elsewhere. But if you have the granules applied, any that migrate will surely die. Next, spray as much of the tree as you can with the Cypermethrin. It’s fast acting and can be applied to all parts of the tree trunk. Using a Hose End Sprayer, you should be able to reach quite high too. Certainly 25-30 feet if not higher since it uses the water pressure of your garden hose. Our Trombone sprayer is another great way to reach high up as you can see in the video we have demonstrating how high it can reach which is 30 ft and more. Are the products you have mentioned safe for birds and other wildlife? I have numerous feeders and do not want to have an adverse effect on the environment. Where do you buy this stuff to get rid of box elder bugs? How much is it to treat a house outside and inside? How often do you have to do it too? Click on the products above to see them in our cart. Where they appear “blue”, those are the links. The main products people spray is the Cypermethrin and Spreader Sticker and here are links for them. You’ll use 1 oz of each per gallon of water and you’ll spray 2-3 gallons for the average sized home. Treatments can last several weeks but you should retreat as is needed to keep them off the home because if you let them linger, they’ll no doubt start nesting in the home which you don’t want. Now there are other items you might need but if you review the material above, you’ll learn the details of what might be needed. We have ordered the Cypermethrin and Spreader Sticker and it should arrive tomorrow. We have been using dishwashing soap and water to control a very large infestation of nymphs, spraying several times daily since we discovered them. That is helping but it has to be done every day. Now we are seeing the adults also. I have only found two nymphs and one adult in the house but it is getting cooler here in IL. I have 2 questions. Do we have to repeat the Cypermethrin application more than once this fall? Also, our home is painted cedar and there are so many crevices it will be virtually impossible to hit them all. If they overwinter in these crevices and behind shutters how can I keep them from laying eggs in the spring? We have two maple trees and an ash and wetlands that we back up to. We noticed a woodpecker this summer in the ash frequently. Is there a product we can use to keep them from laying eggs to alleviate another infestation of this magnitude. I have never experienced this since moving to this house 3 years ago. I read on one site that a hot drought summer like we had can add to this problem. Thank you so much for all the wonderful info you have provided on your site. When the Boxelder Bugs first come to any home, they won’t be hiding. That means a good application with the Cypermethrin will knock them right out before they get “embedded” on the home. The key is getting them before it gets cold so you are definitely ahead of the curve. Boxelders are hardy and will be active well into November so 2-3 treatments should cover you this fall. Many homes will do one good treatment and then followup a few weeks later to be sure they’ve got it under control but that’s usually all you’ll need to do. Only the worse problems will require more than two applications in the fall or spring. Now keep in mind that if you have warm days during the winter and any emerge, you need to spray. Getting them when they come out on either warm winter days or next spring is important and key to breaking the cycle. Lastly, don’t be afraid to spray any plants or ground where you see them active. Boxelders will typically get into pine straw and other ground cover and treating these areas are many times needed too. This page has a lot of great information about controlling box elder beetles. I read the products are safe for people and wildlife; however, my concern is that my dog eats these bugs like they are treats. If she eats the dead bugs would this be harmful for my dog? Thanks! We definitely understand your concern and the answer to your question is no, the dead box elder bugs will not pose a hazard to your pet even if they eat any. Here’s why. The pesticides listed above will be so diluted down when applied they can’t hurt people or pets. And that’s if you ingested them directly. Now once you spray the mixed solution, it will be dispersed over such a large area that one cannot pick up any significant amount of the active and for that reason, there is no risk or inherent danger where they’re applied. Additionally, the pests that die from the treatment won’t have any measurable amount of the treatment on them so they too won’t pose any hazard. Now yes, the concentrate in it’s original form would make one sick if they drank some straight from the bottle and for this reason it must be stored where kids and pets won’t have access. But once mixed, they just don’t have that potential anymore because they’re so dilute. Something else boxelders do is to eat the insulation of insulating draperies and ruining them. They most definitely can cause damage to items made with natural ingredients. Rugs, furniture, carpeting and other things found in living areas of most any home can all serve as food for boxelder bugs! If you seal the cracks after they move in will they die or just continue to live inside? If you seal the cracks without first treating with some Dforce or Phantom Aerosol, whatever is living in the space will most likely end up migrating deeper into the house and this could present all kinds of other issues. So definitely seal the home; just don’t seal up live pests in the process. Treat the cracks first, let the treatments sit for a day and then go to work with some Pur Foam to insect proof the structure. I have a lot of boxelder bugs in my basement. Most of them are dead but now I’m finding them in my living room and bathroom. Its winter time and I’m not sure where they came from. They are becoming a real problem. How do I treat for them and get rid of them? Thank you. First, read the article above. It will help explain why your home is getting infested with boxelder bugs and how you can treat your home to prevent this kind of problem from continuing. As you’ll learn, for now you should treat inside with Dforce or Phantom aerosol. Both will handle boxelder bugs fine and can be used in any room which is showing activity. The Dforce is stronger smelling and works quickly; the Phantom is just about odorless but will take a day or two for the bugs to start dying. Regardless of which you choose to apply, once you get all the the cracks and crevices where they might be nesting treated, you can effectively take away any chance of them getting established in these rooms. Now come the spring, summer and fall, you should start doing some outside applications to get rid of them for good. In most cases, spraying the outside of the home with Cypermethrin will do the trick. But if you’re finding them on a tree, in some pine straw mulch around the home or in other areas of the yard, you’ll need to first apply Deltagard granules to the turf and then spray over the top with the Cypermethrin. Thanks for all the great comments. I came home today to find about 15 box elders on the inside of a sliding glass door in our kitchen. Last fall they swarmed by the hundreds on the west side of our house. You mention several products. Which is the BEST product to eradicate these creatures inside and out? If you read through the article, you’ll learn that in fact we have all these different products listed because they’re all used in different areas of the home depending on where the problem is centered. And for the inside, the crack and crevice aerosol known as Phantom is ideal (since it’s odorless and goes on dry) but Dforce can be used too. And lastly, if they’re active in the yard around trees, flower beds and mulch areas (especially during the summer and fall), the Deltagard Granules would be best suited. Treating these areas when it’s warm outside will get rid of them where they’re surely nesting and in turn, slow if not stop the migration to the home. I live in Central Illinois and got the first nice warm days of the year in a new house. I found probably what would be a couple of hundred boxelders on the outside walls of an addition over a crawl space. I sprayed them with bug spray and then soap and water as I read that worked good. They did all die but there is a definite problem. What steps (in order) should I take to start the process of removing these things!? For starters, read the article above. It will go over all you need to do, the products you need to use and how to apply them. No doubt you’ll need to start using the items we have listed in the article if you want to get rid of them for good. Boxelders are persistent and you’ll need to use the professional products if you want to get rid of them for good. After reading it, if you need some further assistance let us know and we’ll try to help. I have read the article but it really doesn’t say where to start. Maybe I need to add some more information. -I have a basement but area of addition where they seem to be gathering is over a crawl. -I don’t have many inside…maybe 5 or so at most but LOTS outside. With that where do I start?? spray, dust, seal, ?? Do I start now or wait until I see them or certain time of year?? I assume I will be battling them all year but want to take the right steps at the right time in the right order to make sure they dont come back …or find a home in my home this coming winter. Based on the information you’ve provided, it would appear all you need to do now is to apply some granules and then spray the siding of the home. So in the turf around the home – especially on the side that has the activity – apply the Deltagard Granules. Next, spray the Cypermethrin onto the siding of the home using 1 oz per gallon of water per 800 sq/ft of surface area. This should take care of any nesting in the ground and/or on the home and in theory, knock them out. Now it doesn’t mean you should expect one treatment to get rid of them for good. My guess is you’ll need to start now and maybe after 2-3 treatments, they’ll pretty much be gone. As for the inside; there is no evidence to suggest you need to treat there yet based on the small amount you’re seeing inside. But if you start the outside treatments and the activity inside doesn’t stop or at least reduce somewhat, get some Phantom and start treating any room with activity. THANK YOU SO MUCH! ..and will check back in after a few applications to let you know the progress. I too have issues with these ugly elder bugs. The spray treatment you recommend for the exterior of the home; will it stain my siding? Its vinyl. I’ve made the mistake of using an insect spray before and needless to say it left a slight stain on the viny siding. My husband was very upset. Please let me know. Most over-the-counter products contain solvents and stabilizers that can affect plastic and cause staining. But we don’t carry these types of products. Most all of our pesticides are water based with very little of the concentrate used when in the tank when you mix up a gallon to spray. The net result is that what you’re spraying is usually 99% water. So to answer your concern; none of our products will stain. However, if you were to use the wettable powder form of the Cypermethrin, it could leave a “pollen” like film where it’s applied and this film could be noticeable on most any dark surface. And when sprayed on vinyl siding that’s dark, you might be able to see where it was applied. So if you were to go with the wettable power form and found it left a visible residue, simply wash it off. But clearly the easier option would be to use the emulsifiable form of Cypermethrin. This form is a liquid and once mixed with water, won’t leave any visible residue so once it’s dry you won’t even know it’s there. I see a lot of Box Elders that look like they are reproducing, usually a large one with a small one attached to each other at the rear. I have not seen any pictures to be able to identify male from female. Any suggestions? No doubt you need to treat the problem before the population grows anymore. What you’re seeing is exactly what you think you’re seeing: reproducing box elder bugs. And if you leave them be to reproduce and thrive, their population will no doubt grow. This is generally the sequence of events that happens around the home which ultimately leads to them getting inside and causing an unwanted infestation. Now since you didn’t say where you’re seeing all the activity, I’m not able to specifically list what you’ll need to treat. But if you review the article above, you’ll learn what we recommend for the various areas. And here’s a quick summary. So if the activity is in the yard, go with the Delta Gard Granules applied to the ground and then either the Cyonara RTS or Cypermethrin sprayed over the top. If the activity is located on the home, spray it with the Cypermethrin. And if the activity is inside the home, treat the active rooms with Phantom aerosol. In some cases dusting wall voids and/or attics is required to knock out any pockets that might have moved into these spaces. I have discovered box elder bugs in my mulch where I just planted. There is a huge number of them. Am going to spray but will this cypermethrin kill my plants? Should I avoid spraying the leaves? In most cases treating the ground with the Deltagard Granules and then spraying just the ground with Cypermethrin is all you need to do. No need to spray the plants and their leaves. But if you did spray any leaves in the evening and the plants were left to dry overnight, there would be no risk of damage which could happen if you treat mid day and it was 90 degrees or more. No doubt this could burn some leaves. So treat in the evening and there won’t be any problem and remember, the ground in the mulch is usually the more important area to get anyway and generally not the plant leaves. Hi, I have an interesting one for you…We have an infestation of boxelders in our car…Not the inside but the lining and cracks in the doors, hood etc. Have not seen any in/around the engine. My fear is how long they have been there and since we park in the garage should I now be concerned they have migrated to our home. We will spray garage and other areas but, do you think it is safe to spray the car? Thanks for all the great info.! No doubt this type of nesting could lead to issues in the garage which in turn could lead to problems in the home. But the big question here is where are they coming from? Do you think these boxelders are living in the yard and then migrating on the car because you’re leaving it out in the driveway overnight? We have seen cars parked outside in the evening attract various bugs because they’re warm when first parked. And as the cooler nights of fall take hold, many insects will seek warm refuge so a “just used” car will commonly attract such insects. And it doesn’t have to be the engine compartment; any gap or seam in the construction can serve as a good nest site. So to see if they’re coming from the yard, do a good inspection to see if you can locate any nesting in the mulch, flower beds, etc. If you find some active in these areas, get the area treated with some Deltagard Granules and Cyonara RTS. Next, spray the garage and outside of the home with Cypermethrin. Lastly, treat all the cracks and crevices of your car with Phantom aerosol. This product is odorless and goes on “dry” making it ideal for use on a car or other tough to treat area. Treatments will last 2-3 weeks (unless you drive through rain) and if you renew the applications a few times this fall, you won’t find any more boxelders or other insects trying to use it anymore. Goodness, I thought I was alone in this fight! We live in a cedar home in the woods and we have 100 acres of fir trees. I have boxelder bugs every year on the sides of my bat and board home, which has more cracks and crevices than you can imagine. I have vacuumed them, sprayed them, used soap and water on them, bought numerous insect sprays and gadgets….called the county extension agent, you name it, I’ve done it. Every night, I have a jar of soapy water on the coffee table, and each time I see one, I grab it and put it in the jar. Last night, there were probably over 75 bugs in the jar – and that many more in the jar in our bathroom. I will try anything – believe me – if this stuff works I will be your biggest fan ever! We don’t have a yard – just the woods….and I can’t possible treat every single tree – any suggestions? 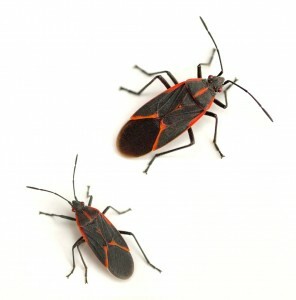 First, there is no need to treat every tree around the home to keep these boxelder bugs off your house. No doubt spraying trees close to the home, like the ones within 25-30 feet, will help. But insects will always thrive out in nature and the best we can hope is that with the right products, we can keep them outside and prevent them from entering our living spaces. Second, to accomplish this goal, you must think “barrier”. And this barrier should be essentially “two lines of defense”. By having two lines in place, it will greatly reduce the activity on the home which in turn, will pretty much eradicate any inside. In fact, if I was doing the treatment, there wouldn’t be any activity in the home. I say this because I know a strategy that will work if done correctly using the right products. So if you’re a do-it-yourselfer and want to get rid of this pest, here’s how to proceed. Mind you your problem is no doubt a bit more “extreme” compared to most. But I have seen bad cases like what you’re describing and when dealing with local populations coming from a forrest, you must prepare by understanding there is potentially an unlimited population of boxelders nearby. Using this mentality, you can prepare for the worse case scenario and in doing so, put in place the proper line of defense. So the first thing I’d do is dust the homes exterior with Drione Dust. Listed in the article above, Drione is unique in that treatments will last 6-12 months so you don’t have to continuously apply it. And its highly repellent to insects so they stay away from where its been applied. This means if you apply it to all the cracks and crevices of your homes exterior, you’ll take this prime bit of nesting area away from them. You see, boxelder bugs love nesting on wood. And your homes exterior siding is exactly what they love! Wood siding with gaps and crevices is about the most perfect spot for them to roost and nest so what you have happening is entirely expected and no surprise. In fact, they can “smell” such locations. And without using the right products on your homes exterior, this has been the one of the main reasons why your problem is so extreme. Now once you start using the Drione applied with a Hand Duster, you’ll notice boxelders (and any other insect) rapidly leaving the area. Basically anything in the areas you dust will be killed within minutes and with the dust in place, nothing else will come to the space for sometime. Now if the home is tall and you can’t reach all the siding that runs up to the roof, get a Dustick. This device is well worth the investment. The Dustick will allow you to apply the Drione up to 25 feet high while standing on the ground. Basically it will enable you to get the Drione applied to every bit of the homes siding which is important. Next, you’ll need to apply Deltagard Granules to the turf around the home. Treat at least 25 feet “out” from all sides of the structure. Focus on areas with pine straw or other mulch. I’m assuming you have lots of mulch around the home and these are key nest sites for boxelder bugs too. Apply these every 1-2 months for the first year; every 2-3 months once the problem is under control after 1 year. Next, you’ll want to spray the homes exterior and any bushes or trees they’re roosting on with the Cypermethrin listed above. Expect to use 2-3 gallons to treat the homes exterior and another couple of gallons to treat the trees and shrubs. This should be done monthly for the first year during the spring, summer and fall. And once the problem is under control, you can spread out treatments to every 2-3 months to keep them in check. Mix the Cypermethrin at 1 oz per gallon of water. Lastly, use Phantom aerosol inside the home to every crack and crevice where you think they’re either nesting or entering. Phantom goes on dry and is odorless making it ideal for use inside. You’ll need to use this monthly too but like the other products, once the problem is under control, you’ll be able to wait 2-3 months in between treatments. The good news is boxelder bugs are easy to control as long as you get all the areas where they might be nesting. And if you follow my directions and apply the listed products to the areas I’ve mentioned, you’ll see instant results. If the work is done correctly, I would expect you to see a lot of dead boxelder bugs the first day of treating and within a week, very little activity will be noticed. By 2-3 weeks, they’ll mostly be gone but only if you stay the course and keep treating monthly for the first year to insure they’ll be gone for good.